Agnes Catherine Gaffney was one of four students in the graduating class of 1890 from Conneaut High School in 1890. According to the 1940 United States Federal Census, she went on to complete three years of college, making her the highest educated member of her immediate family and the only one to have gone beyond high school. She taught at various schools in Conneaut, Cleveland, and Ashtabula, including the Station Street School in Ashtabula and Collinwood High School in Cleveland. In those days as now, Agnes would have had to sign a contract upon her employment, agreeing to perform her duties faithfully and diligently. Her duties included not only teaching but also janitorial duties. She would have had to start the fire on winter mornings before her students arrived and sweep and scrub the floors and wipe down the desks and chalkboards at the end of the day. She also had to abide by a high standard of conduct in her personal and professional life. As a model of virtue to her pupils, she was expected to avoid anything that might give the slightest hint of scandal. This meant that she could not be alone with a man unless he was her father or brother. Further, she could not marry during her teaching career. She could not smoke, drink, or even dye her hair. She was expected to be home by eight at night. And home could not be just any place. Her teachers’ pay would have been meager, making it difficult to afford her own home. If she did not reside with her own family or in a teacherage – a dwelling next to or part of a one room schoolhouse, she would have rented a room from a respected local family. As a result, she lived in several places during her career, seemingly according to where the jobs were. These rules were not unusual in nineteenth and early twentieth century America. In fact, to see a typical teacher’s contract and rules in 1905 for teachers in Ames, Iowa, another midwestern town, click here. However, with so many regulations, it is understandable that many women did not teach for more than about five years. 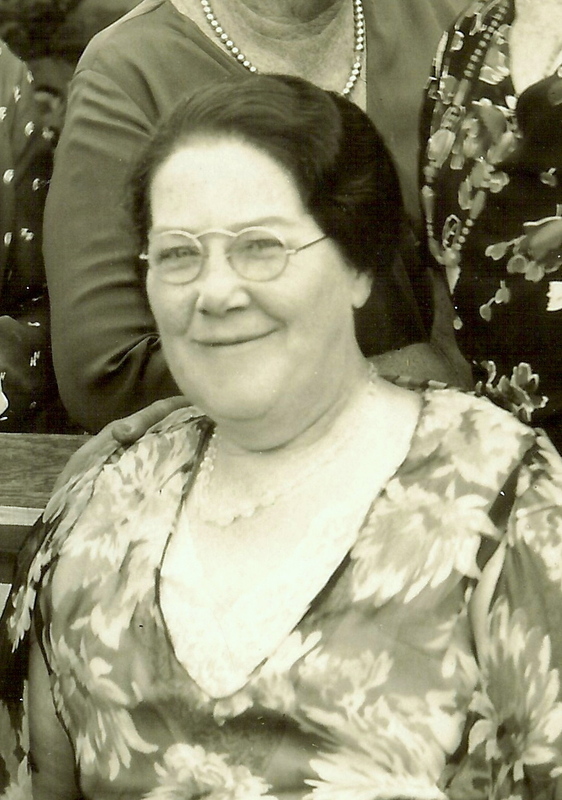 Agnes, though, taught for most of her life and never married. She retired sometime before 1940. By then she was 67 and shared a home in Cleveland, Ohio, with her sisters Maggie, Di; and a nephew, John Cherry. They occupied their days with reading, baking, and visiting friends and relatives; and they spent their summers with the extended family at the cottage of my maternal grandparents, Ralph and Alice (McGinnis) Schiavon at Big Blue Lake, Michigan. As with several of her sisters, Agnes suffered from obesity and its consequences. She developed arthritis in her later years and suffered further as she watched her close-knit family succumb to heart disease and various forms of cancer. She, Maggie, and Di seem to have moved back to the family home at 397 Mill Street in Conneaut in the late 1940s, perhaps because of their failing health. Frances (Gaffney) Cherry, who had been widowed some time before, still lived there, as did her son, John Cherry. John Gaffney (another of the Gaffney siblings) had died before 1920, but his daughter, Nancy, was in her 40s by then and also lived in Conneaut. Maggie, who had suffered from kidney and heart disease, died in 1949. The following year, Agnes was diagnosed with bladder cancer. It must have seemed like her world was caving in when her sister Delia developed uterine cancer shortly afterward. Still, the sisters were as strong in spirit as they had been close their life long. Despite the gravity of their condition, they helped one another as best they could, together with their older sister Frances “Frank,” who was suffering from heart failure. According to my mother, Joan (Schiavon) Huesca, they never lost their sense of humor and love of life through it all. In the spring of 1952, Agnes entered Conneaut’s Brown Memorial Hospital. When she died there on April 4, 1952, her nephew, John Cherry, noted that she was only two days away from her 80th birthday. Delia and Frances would follow her within the next 12 months. The social history really adds to this brief biography of Agnes's life. I found your blog on Jana's Fab Friday list. Wow, that's quite an honor, Jana! Thank you for the kind mention! Best regards. Thank you, Wendy! I found it fascinating, too. I believe that learning about our ancestors' world helps give us a clearer understanding of them and their circumstances. I'm glad you found Jana's Fab Friday. I always find something new to learn from them. Thank you for stopping by, and have a good weekend.